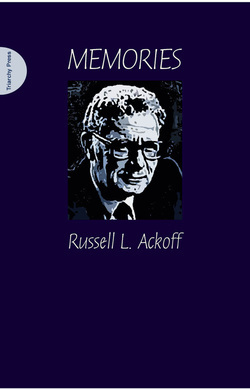 "Russ was an incisive, lifelong critic of the modern organizational form. He saw its limitations and argued for radical redesign. He was an advocate for major re-visioning and processes of change that started with helping people see what they truly valued and where they truly wanted to get - and then working backwards to see what it would take to get there." As he says in his Preface, "Life is a series of relationships formed and dissolved". For Russ, the important principles and qualities around which his work was centred - clear-sightedness, looking at the bigger picture, working backwards towards solutions, radicalism - crossed over into most, if not all, other aspects of his extraordinary life. The stories in Memories focus on the human side of life and, in so doing, they demonstrate how many of the skills and attributes that are fundamental to professional success are found in personal experience. In this book, Russ draws from his experiences of serving in the US army during World War II; of bringing up a young family; of encountering different cultures whilst working abroad. From analyzing birth rates in India, to a fireside chat with the Queen of Iran, to introducing theme parks to the US, the stories collected in Memories lay bare the workings of a number of well-known businesses and other organizations - and the people who run them. They describe common attitudes, behaviours and assumptions, which, if left unchallenged, can destabilize or even destroy an organization. The book shows how thinking systemically leads to real organizational improvements in a variety of academic and workplace settings and - just as important - how failure to do so can be both personally embarrassing and damaging to the organization. Each story is used to illustrate a belief, principle or conclusion central to Russ's theories of Systems Thinking and Design Thinking. And each of them is told with his customary generosity, wit and wisdom. Memories is available in paperback or in a hardcover Collector's Edition. Fellow academics and consultants, managers, business studies students.